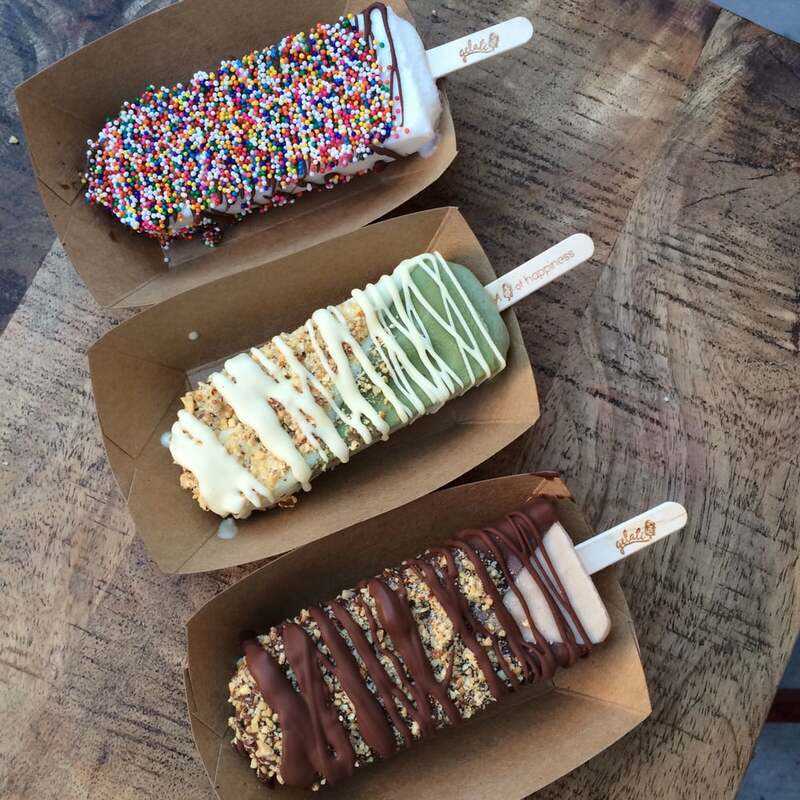 GELATO ON A STICK? This place reminded me of the pop up magnum stores where you can design your own magnum with chocolate dippings and toppings in London. I found this through going to another gelato on a stick place called POPBAR , although, it was all the way in Saratoga, so when I yelped this place, it mentioned a ferrero rocher gelato, and you know I will be there in a heartbeat! They do many delicious flavors like pistachio, salted caramel, cookies & cream, green tea, mango, strawberry, you name it, they have it! They also do some yummy toppings like almonds, nuts, sprinkles, fruity pebbles, chocolate drizzles. Such a fun place to go to with your little one or even friends. Also, it's a great place to boomerang them drizzling the chocolate. Makes for a great Insta-story! FUN FACT: There's a beach literally 5 mins away called Alameda beach, so you can relax at the beach while having your ice cream (that's if you don't eat it by the time you get there!) We like to go sit there and relax while our little one is busy playing in the sand. BEST GELATO I HAVE EVER HAD! We just discovered it on a random Friday night when we headed to the city for dinner. We were looking for a sweet tooth and Friday night is our treat day. I am a major hazelnut lover, so I got a small scoop of Gianduia for my self and it literally tasted like a ferrero had just melted in my mouth. I knew I made the wrong decision and should've got a large scoop. But don't worry we took a tub home, it was that good! It obviously tasted better fresh so check it out when your'e in the city next time! FUN FACT : The masters behind this amazing gelato went to Gelato university (Is that even a thing, I know right!) where they were trained by the top italian gelato maker. TOO PRETTY TO EAT! Being European, Amorino was always a fun place to go for a spontaneous treat with my mother, (she's a major ice cream lover). But when I found out they came to California, I was super excited to finally get some hands on some delicious gelato and of course take pics of the super Insta-worthy gelato shaped flower. Ok, I'll be honest, I don't pick flavors according to my taste buds but more the color so I can get a pretty snap of it at the end. My husband thinks im crazy, but my insta-mind gets the better of me sometimes and anyway my husband always gets the best flavors, so I just take his! There used to be one close to where I live, but now the closest Amorino cafe is located in Livermore, although I heard there will be one opening up in the city soon. FUN FACT: They also sell macarons, waffles, crepes, Italian coffee or hot chocolate. So many options here! A must go! SMITTEN OVER SMITTEN! Liquid nitrogen you say? There's nothing like attracting consumers with a wave of steam that rises when the super-cold, liquid nitrogen gas hits the liquid ice cream base. Not only is it super cool to watch your ice cream being made to your own personal taste, but it also has the most amazing smooth velvety texture. I always tend to go for the same flavor (TCHO CHOCOLATE WITH CHOCOLATE SAUCE) but they do some fun unique flavors. like Strawberry Balsamic, Honey peach nectarine, Blood Orange pistachio, Sticky Toffee pudding. It all depends on the month and season. They have a few locations spread out through the Bay area so no excuses! Fun Fact: Smitten owner Robyn Sue started selling her Smitten Ice Cream out of a Radio Flyer wagon in San Francisco. It was a nerdy product that fused nostalgia and science: Her homemade ice cream was made to order, flash-frozen at the time of sale with liquid nitrogen in her own ice cream machine that was powered by a battery pack she built out of an old motorcycle battery. EXTRA SIDE OF HOT FUDGE, PLEASE! This place is a major place to go for any kind of celebration. We always go here when it's someone's birthday or when someone is in town. This is also my mum's favourite place to come to when she is in town. She will never say no to Fenton's. So, let me talk about there FUDGE! OH MY! I order a separate side of fudge on top of this large sundae of Black & Tan. I can't get enough of it. Fun Fact: Fenton's is exclusively BAY AREA! You won't get the same ice cream or FUDGE anywhere else, so when in town make sure to check it out. There are two locations in Oakland and also Vacaville. If you are looking for beautiful desserts to end your Friday night after dinner on Mission, this is the place to be. This super cute little hole in the wall has a selection of beautifully crafted chocolates, mini-gelato bars and pastries. They are a little pricey for a something the size of half of a haagen daz bar, but they make up for there visually creative design. Everything is pretty to look at, the careful work put into making these treats, you have to have a certain level of love to appreciate these desserts. Fun Fact: They do gluten free and vegetarian desserts too. Ask before hand to see what they have on the menu as they change up there items.